Phil Celia was one of the good ones. Playing back the songs of his which I've posted here (and to WFMU) is one way of compiling a song-poem greatest hits collection. 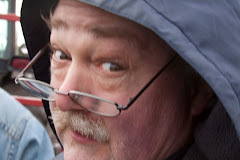 Just a review of those song titles brings a smile to my face: "Moaning and Groaning Twist", "A Fat Man in a Compact Car", "If Butch the Rough Barber Man Shaves Castro", "I'm Sorry I Put On Charlie's Shoes" (admittedly, most of these are in the dead zone of my site, where I still need to go back in and replace the files). 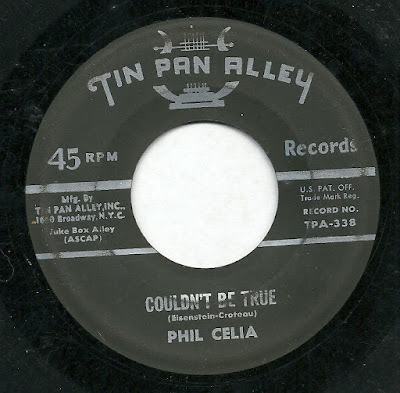 "Couldn't Be True is not, perhaps, at that level, but it's still a fun, night-clubby style record with a lounge-lizard lead vocal, and a fine addition to the Phil Celia collection. 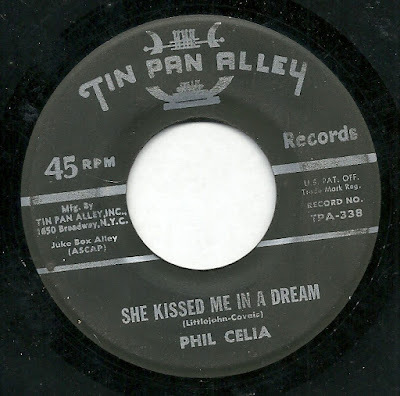 Then, on the other hand, there is "She Kissed Me in a Dream", which is certainly the most ponderous, deadly track I remember hearing from dear ol' Phil. Rarely, apart from Halmark and Noval releases, has three minutes seemed to stretch out so long. (In fact, this sort of sounds like a Noval track to me.) And I'm a big fan of over-the-top echo when it's in the service of something raucous or ridiculous, but in this setting, he just sounds like he's singing in a sewer pipe, and the slow setting plays up some of his vocal limitations. 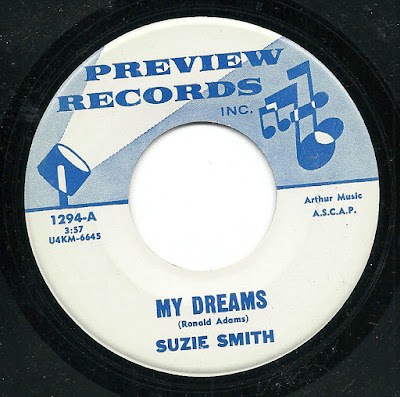 I've got a really nice pair of songs and performances for the first post of the new year, on a label which is new to me, and by a performer who might be new to me. 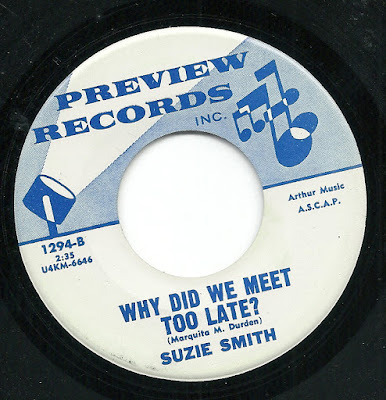 The label is Cozy Records, and while I have no proof that this is a song-poem label, there is a record of the same song-poet writing another song for a known song-poem label. Plus, I think it's at likely that the singer, "Bobby Barton", is the same singer who usually went by the name "Rod Barton", and who made plenty of song-poem records in his day (and who is the only person from the song-poem world that I've ever been lucky enough to talk to). Both of these sides are bouncy, rockin' fun. 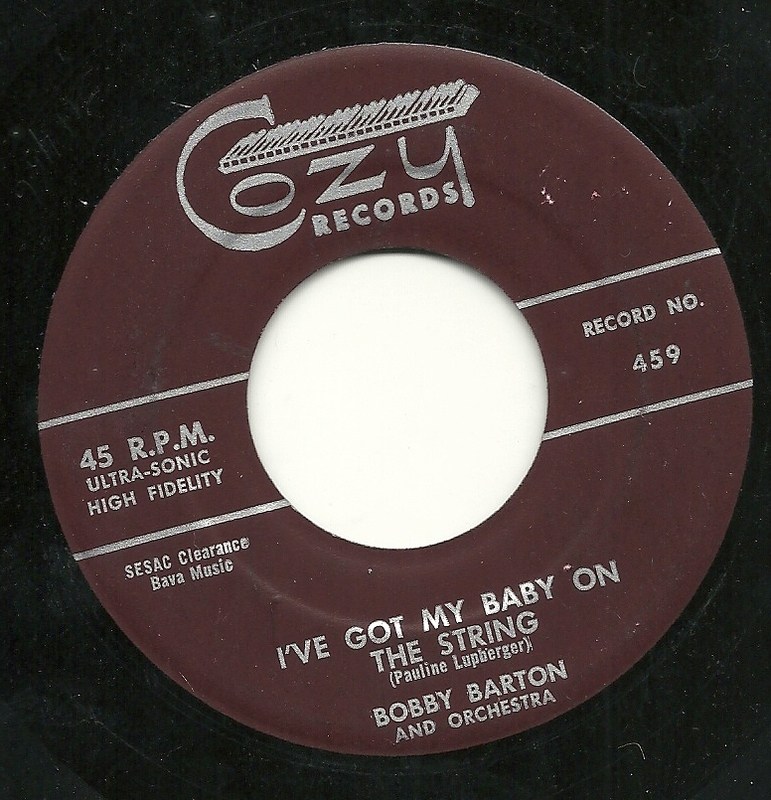 My favorite of the two, by a hair, is the slightly oddly titled "I've Got My Baby On the String" (shouldn't that be "on a string"?). 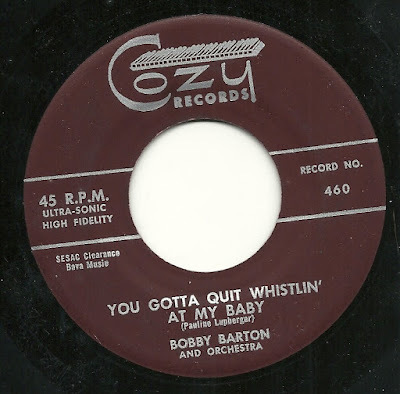 For just under two minutes, the band swings, the guitarist provides tasty flavoring, and Bobby gives the lyric the attitude it deserves. Interestingly, both of these songs seem to very much have a male perspective built into the lyrics, yet both were written by a woman. 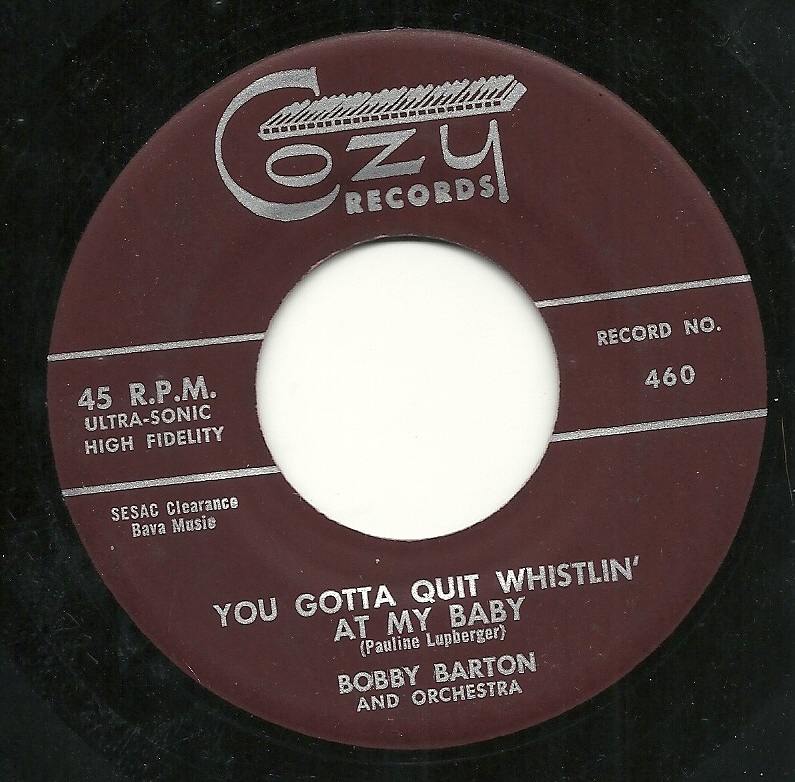 The flip side, "You Gotta Quit Whistlin' At My Baby", is almost as fun. 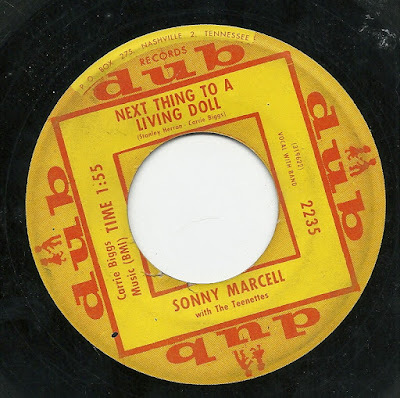 It's just a touch slower than the other song, still swinging, but with more of a bump-and-grind feel, particularly in the drums. 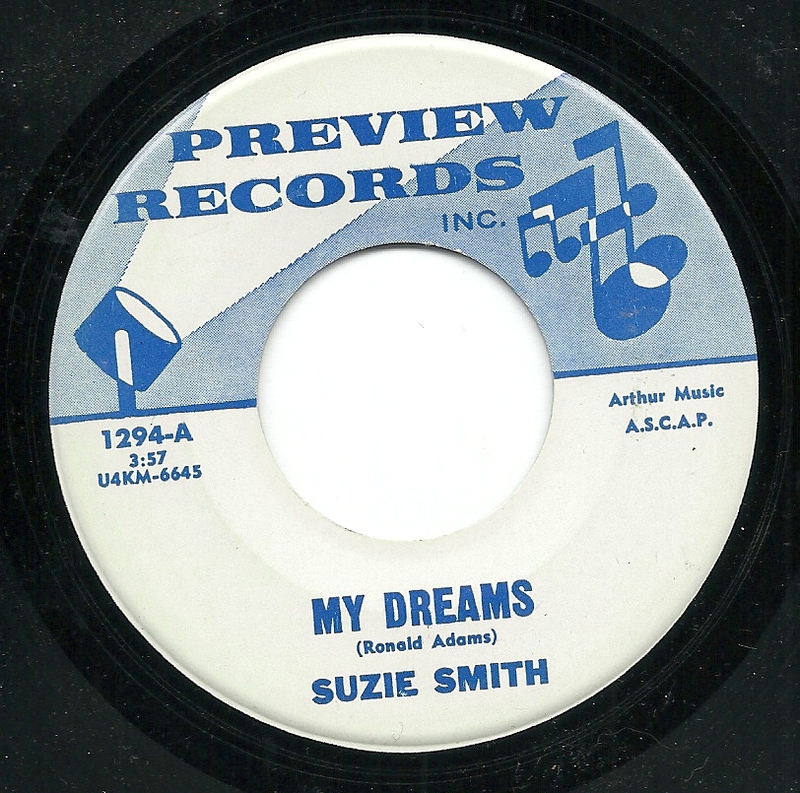 The singer - whatever his real name - again delivers just the right attitude demanded by the lyrics. 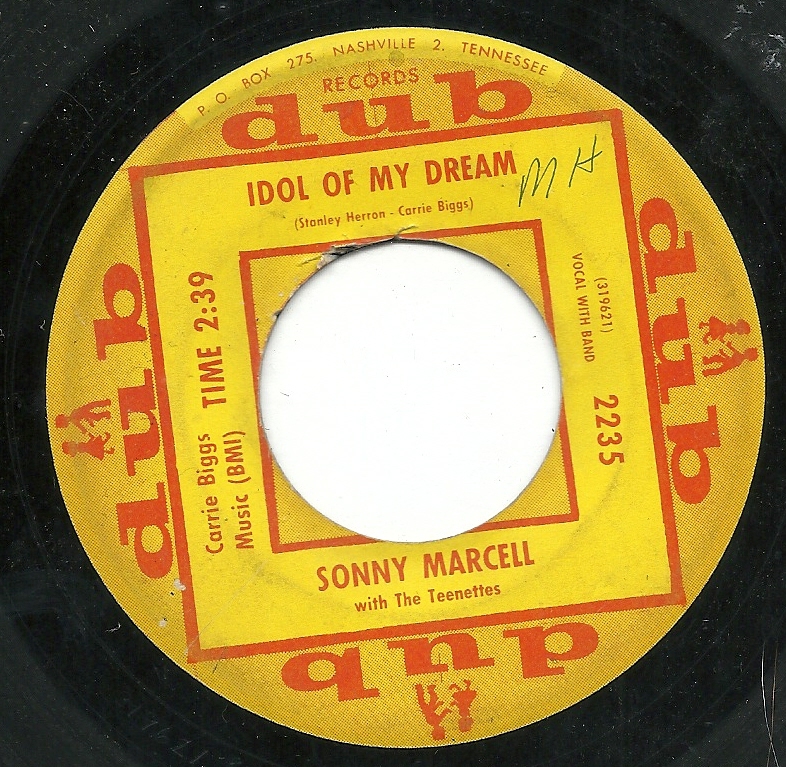 Please be sure to note the Ultra-Sonic High Fidelity of both of these tracks.